Congress is currently seeking a ban on texting while driving after studies have shown that the practice is as dangerous -- or more so -- than drunk driving. Further, it's been found that even talking on a cellphone while driving means you have a four times greater chance of having an accident. 1. Hold a business conversation while you're in the bathroom. You may think I can't hear the toilet flushing or the water running or someone calling "can you hand me some toilet paper?" but I can. Really, I can wait 10 minutes until you're out of the john. 2. Do noisy multitasking when on a conference call. It's cool that you can work from home, but washing the dishes, loading the laundry, using a Weedwacker and drying your hair is distracting. 3. Call me as soon as you land. As I said before, I can wait 10 minutes until you de-plane. Please don't make me listen to you and 100 other people say, "I've landed." 4. Use a cellphone when you are traveling through the Appalachians. Or some other area where service is spotty as best. If you KNOW you're going to have lousy reception, if you KNOW you're going to fade in and out like Britney Spears, then use e-mail or find a decent land line and call me. Don't say, "I'll probably lose you!" and then do it five times in 30 minutes. I didn't get lost that much when I was 5-years-old. I think this would a great forum to lay down some electronic gadget rules for the workplace. Care to add to my list? Could Your Texting Get You In Legal Hot Water at Work? "Never put anything in a e-mail message you wouldn't want read in front of 12 lawyers." That's the best advice I've ever been given by a lawyer, and I pass it along as often as I can. The reason is this: lawyers love e-mails when they prepare a lawsuit for sexual harassment or labor rules violations. The same lawyer who told me that little gem also told me that lawyers say e-mail is the "gift that keeps on giving." It seems so. Recently I visited a lawyer friend who had boxes and boxes of stuff being delivered to his office. He told me they were all e-mails from several years ago involving a case he was working on. He then told me that was just a drop in the bucket -- many more boxes would be delivered throughout the week. As you may or may not understand, e-mail doesn't go away. It hangs around longer than cockroaches. And, even though you may think you've killed an e-mail, you haven't. Some tech-savvy lawyer will always be able to retrieve it. The reason I bring up this message again is that the legal scope of what employers and/or lawyers will investigate regarding employee communications has widened. According to the National Law Journal, "textual harassment" claims are on the rise. "Texting may seem to users as ephemeral — and hard to trace — as a phone conversation. But the messages leave behind an electronic record, and for lawyers, those records are increasingly being used to bolster a variety of claims, particularly in the workplace. For employers, that means a growing source of liability as business-related texting continues to proliferate," the story says. "The most prominent cases, thus far, have involved male bosses who have sent scandalous texts to female employees, asking them out on dates or promising promotions in exchange for sexual favors. In litigation, texts have become even more potent than e-mail, employment lawyers say, as texters tend to be more casual with their language. Texts can also serve plaintiffs by helping prove that they have been at a particular place at a particular time. "Certainly what we're seeing is just rather unfathomable....You'd think that people would know that this is something that they shouldn't do, but they seem to be doing it anyway," said Danielle Urban, an attorney in the Denver office of Atlanta's Fisher & Phillips who is currently defending two employers in separate textual harassment lawsuits. They involve lower-level managers allegedly texting photos of their genitalia to female subordinates. "I don't know what it is about texting," Urban said. "But it's really bringing out the worst in people." So, consider this your warning. In this tough economy, the last thing you need is for your employer to fire you for such behavior. Keep your texting and e-mailing so clean that 12 lawyers would be bored to death. What other mistakes do people make regarding electronic communication at work? Do Online Classes Make Sense for Your Career? I was done with school. Forever. I looked at fellow graduates who said they were going to get their master's degrees or even their PhD's with the same face I used to pick squashed bugs off the bottom of my shoes. "Ugh!" I'd exclaim, walking away from them quickly for fear I'd catch whatever it was that was making them insane. As the job market continues to flounder, many professionals are turning to online classes as a way to help save a current career or start a new one -- but both universities and students are warning that not all online educations are created the same. Having just the opposite experience was Jan Melnick, who said she found her online classes from 2004 to 2007 were a perfect fit for her busy lifestyle as a businesswoman and mother of three. Those varying experiences are why David Clinefelter, provost at Kaplan University, based in Davenport, Iowa, says those seeking an online education need to do some homework before they even take their first class. Clinefelter says that prospective students need to check out everything from the school’s accreditation to quality controls to considering their own learning styles. Melnick says that she was one of those who had very specific criteria in mind when she went searching for an online university. Costing the same as if she were attending regular classes ($25,000-$30,000 for a bachelor’s degree), Melnick was ready to be challenged by a tough curriculum. • Make sure the online university is regionally accredited. Check out the U.S. Department of Education database of accreditation. • Verify that the university offers a degree that will be valued by the industry or career you are pursuing. • Check out not only the academic credentials of professors, but what real-world, professional experience they bring to the classroom. • Ask whether the university will accept transfer credits in order to avoid paying for a class you’ve already taken somewhere else. • Determine that there is a commitment to quality. For example, the classes should be consistent (not changing every time there is a new professor), and there should be a clear method for measuring student learning outcomes from the classes. Also, the university should be responsive to the demands of a profession, keeping current on what is needed to give students the skills and knowledge they need to compete. • Think about your learning style. While Cornell says she needed more human interaction and better communication than provided online, Melnick says she excels in written communication and working independently, so the online classes suited her. It’s a good idea to ask an academic admissions advisor or check the university’s website to find out the student/faculty ratio; how you will interact and communicate with faculty; the teaching style online; the opportunities to interact with other students; and what academic and/or technical support is available. • Consider your age. Those interviewed for this story agree that online courses are better suited to the “older” student. Clinefelter says the majority of Kaplan’s online students are female, in their mid-30s and have children. Melnick adds that she believes the self-discipline and more “experienced and real-world view” of the older student are better suited to the online classroom. What are some important criteria to use when deciding to go back to school? No one talks much these days about quitting a job. After all, with an unemployment rate heading towards 10 percent, most of the focus has been on how to get a job and keep a job. Still, you know that if a great opportunity came along, you might jump at it. It could be because it offered more money, but it also might be because you felt it gives you a chance to do something you feel passionate about, or perhaps because you feel it's a more stable position. Whatever the reason, it's more important than ever that you make sure you make a stellar exit. Keep in mind that how you leave a position is often how you are remembered most by colleagues and your boss. 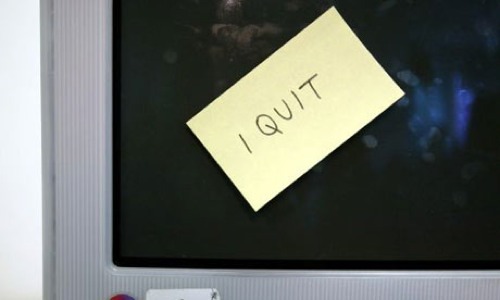 And, as we all know, the world is often a small one – so quitting a job poorly may come back to haunt you for years to come, perhaps even adversely affecting other job opportunities. This lesson, unfortunately, is one that many people in this job market have not come to understand until it's too late. • Prepare. Before you tell the boss, understand your company’s policy about employees who quit. Some require you to be removed immediately. If this is the case, make sure you have all your personal files removed from your computer and have cleared away any questionable material from your desk. • Make it legal. Your resignation letter to your boss should be professional (no sarcasm, hateful comments, etc.) and state clearly your intentions. Include: the date the letter is written, your official last day (two weeks is the common courtesy) and your legal name, along with your signature. This is the letter that will go in your personnel file so there’s no need to be long-winded. If you can’t think of anything nice to say, think Richard Nixon. He resigned in just seven words, but we all got the point quite clearly. • Practice. Rehearse what you plan to say to co-workers and the boss when you decide to quit. Make sure you don’t make any disparaging comments about the business, or say something like how “not working with such losers anymore will be so nice.” Also, don’t offer too much information about your future plans, since it’s not good form to talk about all the exciting opportunities that await you and how you’re going to be making loads of money and working with great people, blah, blah, blah. None of that helps your boss or your co-workers, and just makes them sort of, well, hate you. • Be a pro until the end. Don’t start slacking off on your duties. In fact, you might have to put in some extra time getting files in order; briefing others where you stand on projects; informing your customers who to contact after you leave; leaving notes on where to find information that will be needed; and meeting with the boss to let him know you’re trying to dot all the i’s and cross all the t’s before you leave. And, for goodness’ sake, don’t take your departure as a sign to start loading up the backpack with goodies from the supply cabinet. Be absolutely sure you don’t take anything that doesn’t belong to you, not even a pencil. Check at home to make sure you don’t have any company property, and if you do, return it promptly. • Exit gracefully. If you have an exit interview, don’t use it as a chance to vent any hard feelings. Again, this will get back to the boss, and sink your reputation in his eyes and in others. Remember, bosses talk to other bosses, and human resource people talk to other human resource people. Being seen as difficult and vengeful and taking potshots on your way out the door will not help your career. Also, remember that if you criticize a co-worker today, that same person may just turn out to be a future boss tomorrow. Leaving with a firm handshake and a smile will serve you well in the long run. What are some other ways to make sure your exit is a professional one? My last post about the rudeness of hiring managers garnered a lot of attention, and as you can see from the comments, many people are truly bugged by uncivil behavior in the job interview process. For Andrew Rosen, rudeness at work is embodied by the co- workers who “use their outside voices” to talk about everything from celebrity gossip to their jobs. “If I were a boss, I’d take into account that I may not see the day-to-day impact someone has on other people, and I would check that out” before promoting someone, says Rosen, a website manager for a nonprofit in New York City. That’s exactly what Christine Pearson, a management professor, hopes will happen. She has written a new book with Christine Porath called “The Cost of Bad Behavior: How Incivility is Damaging Your Business and What to Do About It,” (Portfolio, $25.95). While there have been other books talking about the jerks at work, Pearson says this one is aimed at what matters most to businesses – the bottom line. Specifically, the authors argue that by looking at issues such as the hours of productivity lost due to incivility – whether it’s from a worker trying to avoid a rude colleague or workers trying to dodge the number of hours they spend at work – bad behavior has consequences for an entire organization. At the same time, Pearson says she believes that the struggling economy has added to incivility in the workplace because of growing stress on workers to perform more with less. Also, the increased stress on worker’s personally and professionally leads to greater sensitivity – and that leads to at least the perception by employees that incivility is on the rise, she says. A whopping 95 percent of those in the workplace say they put up with workplace incivility on a routine basis, and one in five report they suffer through it at least once a week. Some 12 percent of employees get fed up with the whole thing and leave their jobs because of uncivil colleagues. Specifically, Pearson and Porath suggest a no excuse, “zero tolerance” policy for incivility, with rude instigators weeded out and tossed out. Further, they say leaders must not only teach civility, they must show they walk the talk by not promoting or rewarding those who don’t practice what the company preaches. While Pearson says about 60 percent of incivility comes from upper ranks abusing those in the lower tiers of an organization, rudeness really has no boundaries and can happen at even the lower ranks – such as loudness and lack of respect for another’s work space. One of the biggest issues may be that those with the objectionable behavior may not recognize their own rudeness. Pearson says she’s already had inquiries on how to send the book to people anonymously. How has incivility impacted you at work and does your workplace do anything to stop it? I write a lot about how to pen a great resume, what to wear to an interview and how to give terrific answers to tough questions from hiring managers. Now, I think it's time I gave some pointers to interviewers. Not all of them need this advice, but I'm hearing enough horror stories from job candidates that I think it's worthwhile to give them some advice. I'm not going to name names. You know who you are. 1. When you post a job, be prepared. Have a system in place to acknowledge that you've received a resume and/or cover letter when they come flooding in. This can be nothing more than a form e-mail saying "got it." It may cost you some time in the beginning, but it will save you in the long run when job seekers tie up your phone lines or e-mail asking, "Did you get my resume?" Besides, it's just common courtesy. 2. Be on time. You ask job candidates to be on time, yet you keep them cooling their heels in the lobby for an hour? It's unprofessional and rude. Don't forget, the business world is often very small, and you'd hate for your boss to hear of your behavior, especially if it turns out you really p.o. 'd a top candidate. And wouldn't the boss think it was just peachy if a rant turned up online from the candidate criticizing your behavior? 3. Clear a chair. Don't invite someone for an interview and then show them to an office that looks like a landfill and hasn't had an uncluttered chair since 1995. They put on a suit, for goodness's sake, and you can't even get a space cleared for them to sit? Don't make them wish they'd gotten their tetanus shot updated. 4. Pay attention. While there are some badly prepared job candidates, there are plenty who have practiced their answers, done research on your company and are prepared to offer their take on industry trends. So, turn off your phone, your e-mail and put a "do not disturb" sign on your door. Paying attention to anything but what they have to say shows you're not doing your job. And not doing your job may mean you are on the other side of the interviewing table -- soon. 5. Be honest. Most job candidates are just looking for a clue -- anything -- that will tell them about their chances for the position. If you know you're never going to call them back (their skills are all wrong, they want too much money) then tell them. If you're going to call on Thursday, then call on Thursday. If you know the interviewing process is going to drag out another three weeks because the final decision needs to be made by the CEO who is currently fishing in Alaska -- then say it will be at least three weeks before a decision is made. What are some other rules interviewers should follow? Performance evaluations have often been derided by managers and employees alike as being unfair, dysfunctional and morale-busting. But in this tough economy, it could just be they become more popular than ever as employers position themselves to not only get rid of “dead wood” in their employment ranks, but as a way to justify the trimming of employee numbers. That means that if you’ve been showing up late for work for 10 years and no one has said anything, you may be in for a rude awakening in your next performance evaluation. Your behavior may be cited as unacceptable and you will be placed on probation and told to improve your performance or even possibly face being fired, Robinson says. At the same time, Robinson says workplaces may see more managers write up employees for various infractions, ranging from unmet project deadlines to not getting along with co-workers. This is to avoid the dreaded “naked file,” which is an employee’s personnel file void of any reports citing unacceptable behavior – something needed if a company wants to let an employee go and not face future legal actions for an unfair dismissal. • Write back. If there has been a misunderstanding, then write your side of the issue and have it submitted to your manager and put in your personnel file. • Be specific. Make sure that you point out your skills, training and any certifications as a positive counterpoint to any negative comments made by your manager concerning your performance in a review. Robinson also warns workers to be cautious if the boss wants to do a review “out of cycle” – before the usual evaluation time. “It’s usually not good news when that happens,” he says. Robert Hruzek, a project manager for a large global engineering firm in Houston, says that he remembers early in his career when he made mistakes that came back to haunt him during a performance evaluation. Looking back on the experience, he says he was “embarrassed and ashamed” when he received the negative comments from his boss. Still, Hruzek says that times are much tougher now and he agrees with Robinson that employees who have bad habits such as tardiness or absenteeism might not be given another chance. What are some lessons you've learned from performance evaluations? Do Bad Managers Make Us Perform Better? So, which is more important to you: Having a manager you like, or one who can take you to the top of your profession? In our workplace culture, it's been said by some that you've got to be a real butthead to survive and rise through the ranks, and being a jerk is rewarded. It appears that even professional baseball players seem to be grappling with that issue. So, which would you rather have: A manager you don't like who takes you to the "world series," or a manager you like, but who never helps you get to the top of your game?